Remember the BP oil spill? The Exxon Valdez? These famous oil spill incidents remind us of the devastation such an event can cause for businesses, the environment, and countless industries. Although (fortunately) few oil spills are as large and devastating as those mentioned, you still need to have the proper equipment on hand to combat smaller workplace spills. 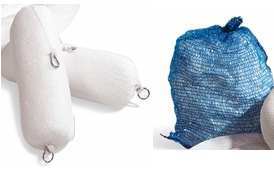 Generally, non-absorbent oil containment booms are great tools for containing dangerous spills. 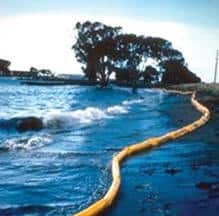 But when you select a non-absorbent containment boom, be sure to consider the environment and water conditions where the booms will be deployed. 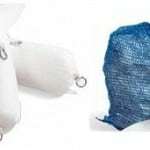 AbsorbentsOnline offers specialized non-absorbent booms that work in various water conditions. You can use this helpful guide to determine what type of boom is right for your particular application. Calm water — The EconoMax Oil Spill Containment Boom floats on top of water and contains debris and oil. A skirting barrier, which hangs below the water line, keeps pollutants contained. This lightweight and compact boom travels and stores easily. Shallow water — For water in streams, canals, and ditches, the Super Swamp Containment Boom is ideal. Made from top-quality, fully welded 22-ounce PVC material, this boom is both cost effective and lightweight. The Super Swamp Containment Boom is easy to clean using a pressure washer and good detergent, so that you can use it multiple times. Marinas, lakes, and harbors —The cylindrical foam flotation blocks of the Simplex Oil Boom make it ideal for shoreline and coastal areas. This boom comes with marine-grade aluminum connectors that easily slide together. Additionally, the boom is compact enough to be employed by just one person. Fast-current waters — The OptiMax Boom works well for rivers, ports, harbors, and estuaries because it has a top tension cable that can be fitted for fast currents and long-term deployment. 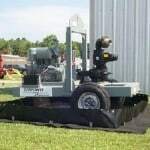 It’s a popular piece of equipment among cleanup contractors for its ability to effectively block oil, trash, and debris. Oil spills can have extreme consequences for the environment and for businesses that don’t have a backup plan. With multiple options available, you can find the non-absorbent boom that provides the right level of spill containment for your needs. AbsorbentsOnline is here to help. Feel free to contact us by email or call toll free at (800) 869-9633. Time to Put Away the Boat? Don’t Forget the Marine Absorbents! removing the battery, charging it, and storing it. Whether you’re doing these tasks yourself or using the services of a marine mechanic, things can get messy. It’s very easy — and common — for fuel or other fluids to be spilled in the water or on land. Both boat owners and marine mechanics need to make sure they have the appropriate products on hand to quickly respond to a marine spill. 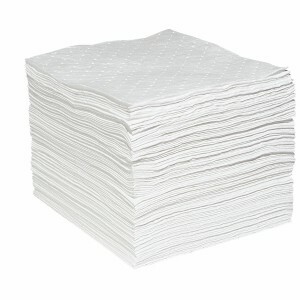 Oil Absorbent Pads — These pads and rolls are perfect for high-traffic areas and low-lint applications. Oil Absorbent Socks — These non-biodegradable socks are flexible, float, and absorb up to 15 times their weight in oil spills. Oil Absorbent Pillows — These smaller pads are ideal for absorbing leaking fluids in tight spaces. Oil Absorbent Booms: These booms float on the water and absorb the hydrocarbon spill without sinking, even when saturated. Bilge Booms: These booms are ideal for removing oil — not water — from your bilge, sump, or tank. They’re wringable, dustless, and will float indefinitely. These oil-absorbent products are very affordable and should be stored on your boat or yacht year round. With these marine oil spill kits, you or your mechanic can take care of an engine leak or a spill before it becomes an environmental problem. Containment Booms vs Berms: What’s The Difference? [sc:date] Some people assume that “booms” and “berms” are the same. While they share some similar characteristics and features, there are a few major differences between them that shouldn’t go unnoticed. 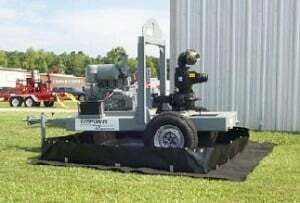 Both booms and berms are two highly effective tools used to contain oil and other hazardous chemical spills; however, their overall design is quite different. If you own or manage a company that deals with oil or hazardous chemicals, you should educate yourself on the functions of a boom vs a berm. A containment berm (as shown in the image to the right) is pool-like structure that’s used to contain a spilled chemical. The berm is placed underneath the source of a chemical leak for quick and easy containment. If a forklift is leaking oil or battery acid, for instance, the berm is assembled underneath the leak. Once construction of the berm is complete, it acts as a miniature swimming pool to contain the spill. There are several different types of containment berms available, one of which is a portable berm. Just as the name suggests, this small yet versatile berm can be easily maneuvered under the source of a leak for instant containment. There are also “assembly” and “no-assembly required” containment berms. It’s not a bad idea for companies to acquire several different types of berms to protect themselves against a variety of chemical spills. A containment boom differs from a berm in the sense that it doesn’t have a bottom (see image to the left). Booms are placed directly over a spill to contain and/or absorb oil and other chemicals. Back when the Deep Water Horizon Oil Spill occurred in the Gulf of Mexico, cleanup crews used booms to contain the oil. Thousands of people participating in the cleanup efforts both at sea and on land. 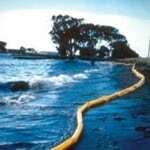 Containment booms played a key role in this cleanup process by limiting the spill’s damage. One of the benefits of using a containment boom is its simplicity. These large rolls are placed in a perimeter surrounding the spilled oil. And since oil is less dense than water, it floats to the surface where it can’t escape. It’s important to note that there are both containment and absorbent booms. 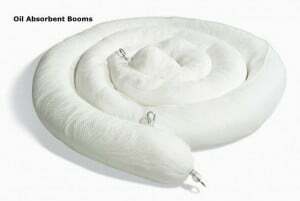 Containment booms are designed specifically for containing oil in a given area, while absorbent booms work to actually clean the oil or chemical. How Does an Oil Containment Boom Work? Approximately 1/3 of the world’s oil comes from offshore drilling sites. While most offshore rigs never run into any problems, there are occasions when damage to either the structure or the actual drill result in oil spilling into the ocean. One example that’s all too familiar is one of the Deepwater Horizon oil spills. The number one combat system against spills such as this is the deployment of containment booms (see image to the left). A containment boom is a large, maneuverable flotation device that’s used to contain oil within a given area. After surveying the situation, first responders to an oil spill will lay out a perimeter of booms to contain the oil. The goal when dealing with an oil spill is to create a full circle of booms with no openings or gaps. Once the boom circle is complete, the oil will remain trapped inside where it can no longer continue to spread. Oil is less dense than water, giving it buyout properties. When oil is released into the ocean, it will naturally float to the surface rather than sinking to the bottom or hovering in the middle. This makes containment booms highly effective at trapping oil spills. Any oil that’s released into the ocean will travel to the surface where booms are waiting to contain it. With that said, oil spreads fast on the surface when it’s not contained. The longer first responders wait to deploy containment booms around the perimeter, the larger the spill area will become. This is why it’s important for responders to work fast during the initial hours of an oil spill. Containment booms aren’t designed to clean up oil spills, but instead their purpose is to contain them. Once the spill area is contained, the cleanup crew will then decide on the best course of action to remove the oil. Skimming machines pull oil from the surface where it’s collected in containers. In the 2006 Deepwater Horizon oil spill, hundreds of skimming machines were used to clean up the murky Gulf waters. Some cleanup crews may use absorbent booms rather than containment booms. Basically, absorbent booms are designed to contain and absorb oil. When the booms are full of oil, they will continue to float until a crew members picks them up. 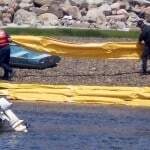 Absorbent oil booms offer a quick and easy way to clean up oil, but some crews prefer the simplicity of basic containment booms.